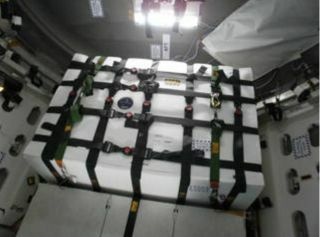 The Saffire-1 hardware is shown strapped into the pressurized cargo module of Orbital ATK's robotic Cygnus spacecraft. The biggest space-fire experiment ever conducted is now in the books. NASA successfully ignited a piece of cotton-fiberglass cloth 1.3 feet wide by 3.3 feet long (0.4 by 1 meter) Tuesday afternoon (June 14) during the first stage of the Spacecraft Fire Experiment, or Saffire-1. Before Saffire-1, the largest fire set intentionally in space had burned a sample just the size of an index card, NASA officials have said. Saffire-1 took place aboard the uncrewed Cygnus spacecraft, a cargo vessel built by Virginia-based company Orbital ATK, which had departed from the International Space Station (ISS) on Tuesday morning after a nearly three-month stay at the orbiting lab. "Our #Saffire experiment traveled 1,000 miles in space while burning on #Cygnus," officials at NASA's Glenn Research Center in Ohio, where Saffire was conceived and developed, said via Twitter Tuesday. #Saffire hardware worked as expected today. Researchers examine sensor data tonight and will share images tomorrow," Glenn officials added in another tweet. More data and high-resolution photos from the experiment will continue to be relayed from Cygnus back to controllers on the ground over the next week, NASA officials said. The freighter is scheduled to burn up intentionally in Earth's atmosphere on June 22. Saffire-1 was the first of three related experiments, all of which will be performed aboard Cygnus vehicles on their way back to Earth. The overall goal is to learn more about how fires spread in microgravity, so that future spacecraft can be designed as safely as possible. "NASA's objective is to reduce the risk of long-duration exploration missions, and a spacecraft fire is one of the biggest concerns for NASA and the international space exploration community," Jason Crusan, director of NASA's Advanced Exploration Systems Division, said in a statement in March, before the Cygnus launched toward the ISS. Like Saffire-1, Saffire-3 will ignite a large-scale fire in space. Saffire-2, on the other hand, will burn samples just 2 inches wide by 12 inches long (5 by 30 centimeters), to investigate oxygen-flammability limits, NASA officials have said. Both Saffire-2 and Saffire-3 are scheduled to fly this year.